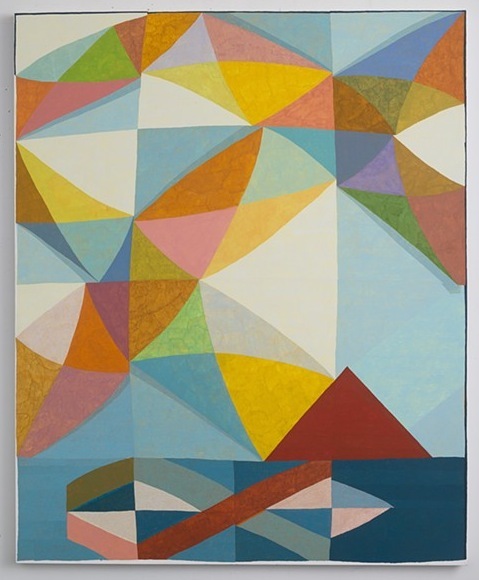 Christopher Joy and Zachary Keeting visit the studio of painter Matt Phillips. Asked about the interaction between the image and support edge, Phillips comments: "I like that the image itself is a form... as you start to make the painting, you're given the rectangle, but that it doesn't necessarily have to live withing that arbitrary shape. It also comes out of an interest in quilts and textiles where you have these image/objects but... the object itself when you put it on the wall is contending with real gravity. So, I think about how would this thing feel on its own outside the rectangle, how does the image droop and sag even though it's rooted in a hard-line geometric sensibility."